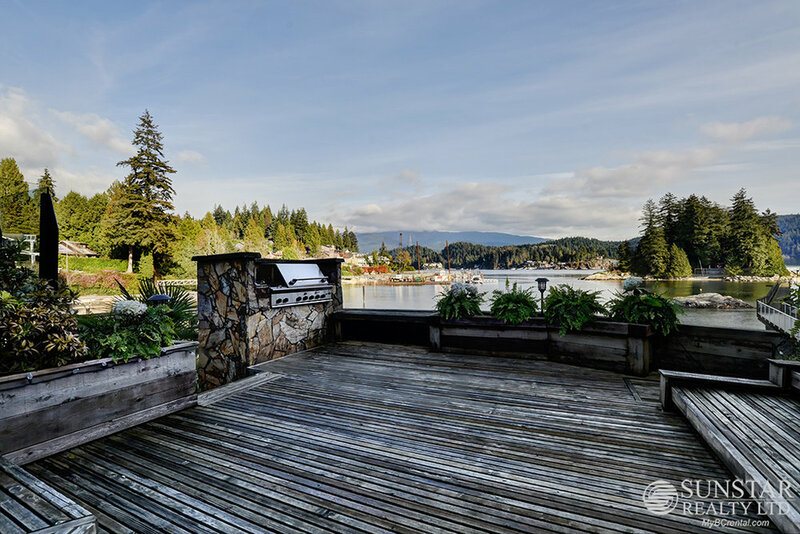 Deep Cove Furnished Waterfront Masterpiece w/ Decks & Views — Lynn Swanson At a glance guide to all currently available fully furnished properties managed or represented by Sunstar Realty Ltd. Outdoor: 3 large decks, outdoor gas BBQ, Jacuzzi and shared dock. 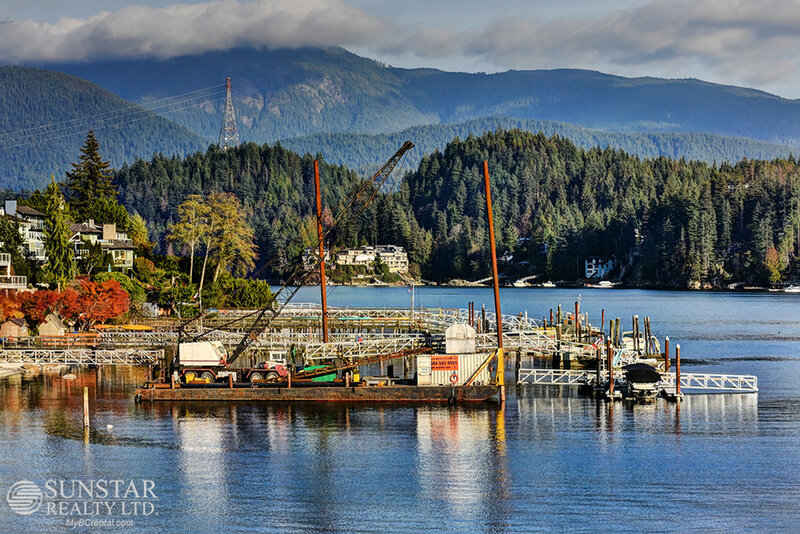 LOCATION: Deep Cove, or 'The Cove' as it is referred to by residents, faces due east and is located at the foot of Mount Seymour. Popular amongst outdoor enthusiasts, this area is close to forests, mountains, skiing, parks and the water. 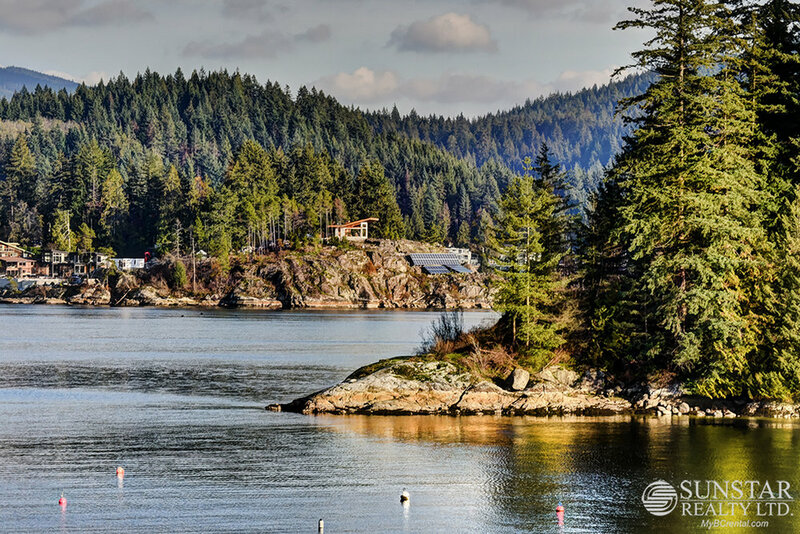 Approximately 5 minute drive to the charming Village of Deep Cove where you will find boutique shopping, dining, Deep Cove Little Theatre and musical performances. Rent kayaks, canoes or paddle boards at the park/beach, or hike one of the many trails close by. Deep Cove is approximately 15-20 minutes drive to Downtown Vancouver, and approximately 15 minutes drive to West Vancouver. Transit nearby. 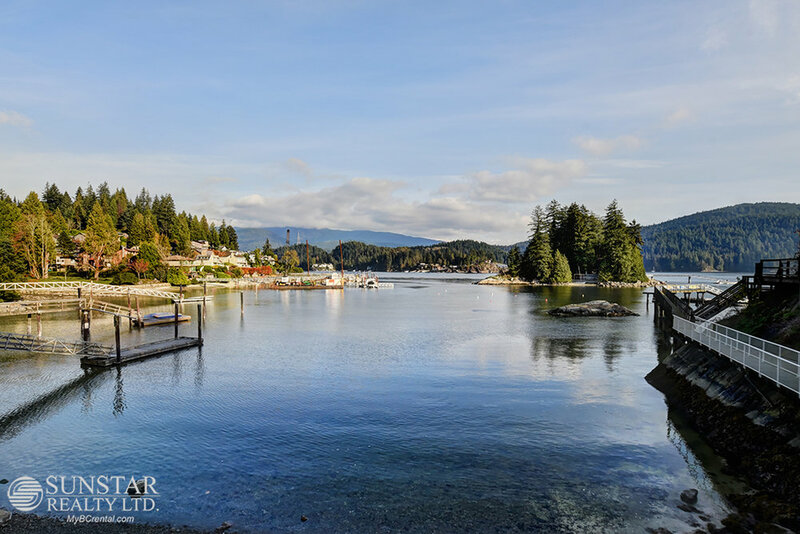 FEATURES: Experience waterfront living in gorgeous Deep Cove! This high quality, spacious, luxury 4 bedroom home has the most breathtaking ocean and island views from just about every room and all surrounding outdoor spaces. Enjoy the yachts, paddle boarders, kayakers and swimmers all year round as they crisscross the inlet before you. Enjoy a dip from the beach below or off the dock, or just explore the beach and sea-life. 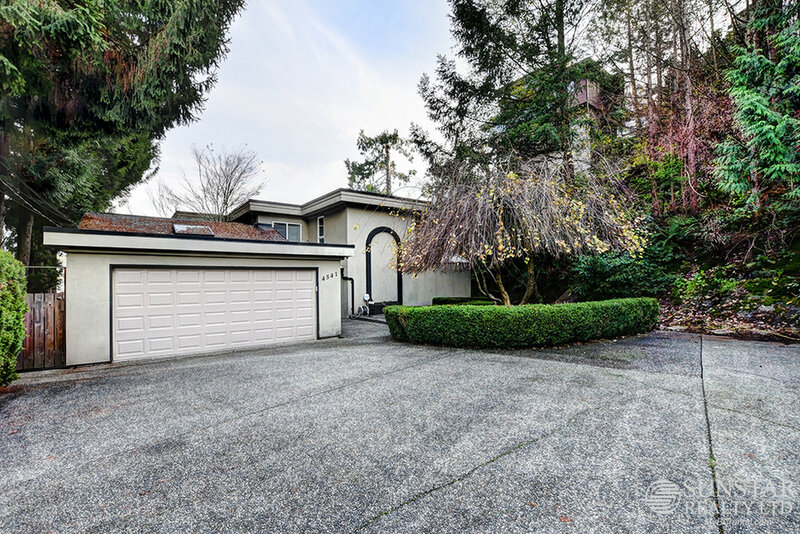 Enter this home through a foyer with beautiful detailed inset hardwood and tile floors which run throughout. Living room, dining room, gourmet kitchen (appointed with highest quality appliances including an Ultraline 4 burner gas range, Subzero fridge and stunning Rainforest Brown Quartzite counters), family room, mudroom and powder room complete this level. Large windows and several sets of sliding doors open onto a very large multilevel deck, furnished with a built in BBQ, Jacuzzi (optional), and Fire Pit for those deliciously long evenings entertaining friends. A desirable floor plan for a family with 4 bedrooms up (3 with queen beds and one single), main and master bathrooms. 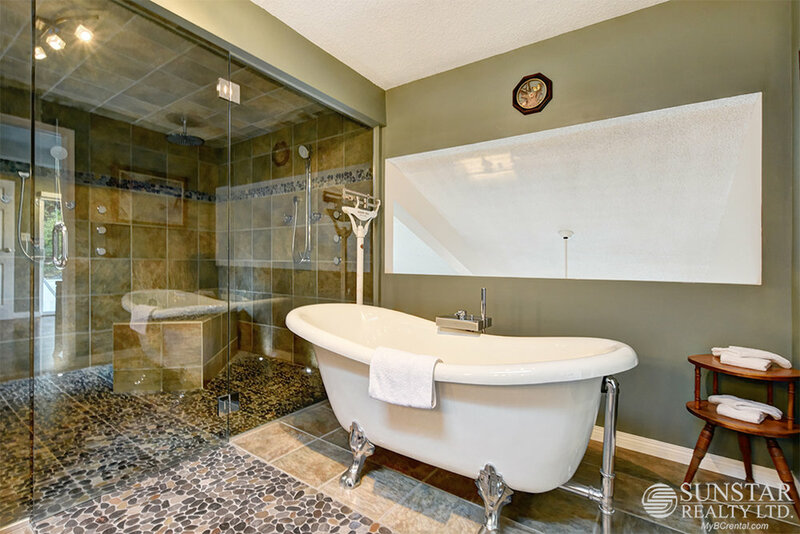 The master bedroom suite has a very large walk in closet and extra large ensuite bathroom with double sinks, stand alone tub and massive shower (with large rainhead plus two hand held showers and numerous body jets). Finally, downstairs is perfect for TV watching with a huge sectional and wall mount TV and office. 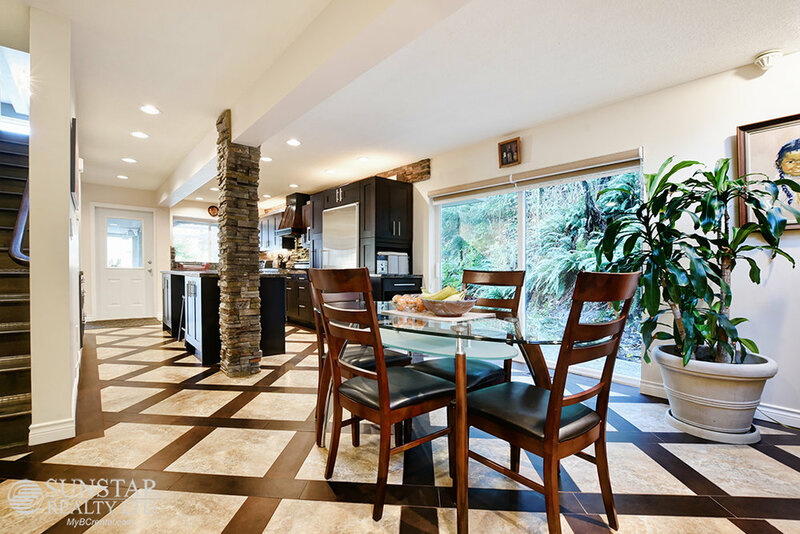 Deep Cove Furnished House - Sunstar Realty Ltd.